Tumblers, Suzanne Sullivan - Genue Inc.Genue Inc.
You know that one image you see all over the internet? On Pinterest, or Instagram over and over again? Well, for a lot of people out there, I bet one of Suzanne Sullivan’s intricately detailed and whimsical painted porcelain cups are one. And, what’s more – it’s hard to even be irritated at Pinterest for showing it to you again, because they are good! Suzanne Sullivan is a native of Portland, Oregon and recently relocated from the Brooklyn neighborhood of Red Hook to her current studio in Pittsburgh, Pennsylvania. Sullivan grew up in a creative household, and has throughout her life has experimented with different mediums to express herself. However, according to Sullivan she turned back to ceramics when her daughter was about ten and had just become really interested in ceramics herself. 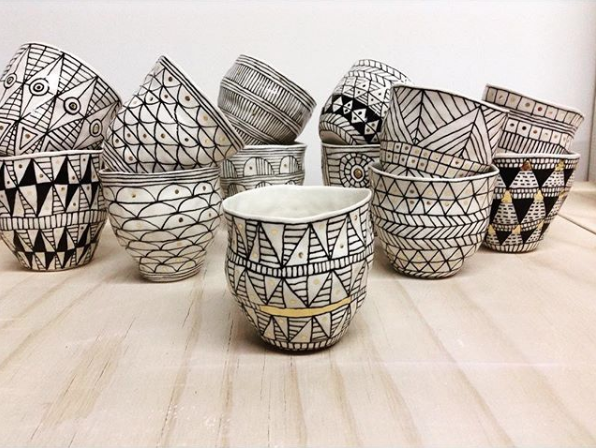 After deciding to start to sell her work earlier in this decade, Suzanne has a dedicated following on social media – her Instagram name is @suzannesullivanceramics – with customers clamoring to get her latest tabletop wares. She primarily makes pinched vessels – rather than thrown on a wheel – leaving the literal mark of the artists’ hand behind. Using a minimal color palette of the natural white of the porcelain, fine black lines and metallic gold accents, her pieces are both modern and casual, patterned and simple simultaneously. To see more of Suzanne Sullivan’s work, and to shop her collection, check out her newly updated and redesigned site here. Her work tends to sell out quickly, so to always be in the know, give her a follow on Instagram as well!